As a kid in the 90s, it’s exciting how far home tech has come. We remember the days of VHS tapes and 4 channels! As well as actually having to be home to watch a particular TV show! Thankfully, technology has developed at the pace of lightspeed and all of these are now obsolete. Pausing TV is now the norm! We’ve even replaced the popular DVD with Blu-ray discs. So the time has come to review the best Blu-ray Players Under £200. Our list of 8 covers 4 brands and a wide price and feature range. We’re certain our list contains at least one Blu-ray player which will match your requirements. Coming in at £50.45 (from Amazon) the LG BP250 Blu-ray and DVD Disc Player is an exciting entry-level unit. Starting with DVDs, the LG BP250 uses HD Up-scaling technology to play your DVD collection in high definition. So, there’s little difference between watching DVDs and Blu-ray discs. Like DVD, Blu-rays are played in hi-def. The LG BP250 also allows you to play media using an external HDD and has a USB port on the front panel. Continuing with the front panel, it’s sleek and minimal. In addition to the USB input and disc tray, there’s an open/close button and a power button. The lack of controls means you’ll have to use the remote, but more on that later. The rear is just as minimal with a power socket and HDMI out, and so you’ll be setup in seconds. Unlike the unit, the remote has far more buttons that you’ll ever need. In addition to all the buttons you’d expect, the bottom row can be used to navigate the BD-ROM menus. You can also pair most major TV brands with the remote to enable power control over your TV. As an LG product, the BP250 offers control using the Brand’s SIMPLINK technology. Finally output. If you don’t like the default 16:9 aspect, you can easily select from 4:3 Letter Box, 4:3 Pan Scan or 16:9 Full. There’s just as many resolution options with auto, 576p, 720p,1080i and 1080p available. Don’t be fooled by the low price, the LG BP250 Blu-ray and DVD Disc Player is a great option. However, there are some negatives. Some recent users have had their unit die within 18 month which isn’t good news at all. While this could be a problem with a batch. If you do purchase a BP250, cross your fingers and hope that if it’s going to die, that it does within the warranty period! Another big problem is the latest software update removes BBC iPlayer, Amazon Prime and other apps you want. However, it strangely leaves BBC news! While this probably isn’t a deal breaker, especially if you have a Google ChromeCast or Amazon Fire Stick, it is annoying. The final bad point is connectivity. With only a single output, you’ll be disappointed if you’re running a 5.1 surround sound system and need multiple outputs. Moving on to the good points. The LG DP250 can play Blu-rays, DVDs, CDs and media via an external hard drive. The remote is well laid out and can be used to control your TV as well. The on-screen menus are easy to follow and allow you to make changes quickly. For the price, it’s well worth it especially if you’re buying a second Blu-ray player for a bedroom or as your first exploration into HD media. Our score: 6/10. Costing £130.31 (available on Amazon), Sony has set the bar very high with the UBP-X500. The unit handles a range of formats and utilises the latest technology to deliver a superior viewing experience. The unit delivers ultra 4K HD viewing across a range of media, thanks to it’s upscaling software. You no longer have to deal with less than perfect quality when playing older movies. In addition to a range of 4K technology, the UBP-X500 also includes Dolby Atmos and DTS: X. Both enhance the sound whether you’re using TV speakers, a sound bar or multi-speaker home theatre setup. While the unit works best with an HDR (High Dynamic Range) TV, don’t worry if you have a non-HDR TV as Sony’s unique algorithm will adjust it’s setting to ensure that you experience the best picture quality. While the UBP-X500 is primarily a Blu-ray player, the unit can also handle DVDs and a range of file formats via the USB socket. The slim, sleek design allows it to fit into any media setup. The minimalist look continues to the front and rear layouts. Starting with the rear, there’s a power input, LAN socket and HDMI output. Moving on to the front, in addition to a USB input, there’s a power on/off button and tray open/close button. With a lack of controls on the unit, you’ll be relieved that the remote, while having a classic Sony look covers a lot of ground. You can easily adjust the movie, the sound, and locate the menu. The remote also enables control over a Sony TV (with on/off and source buttons). In conclusion, setting up the Sony UBP-X500 takes seconds and you’ll be playing Blu-rays or DVDs within minutes. Coming in at just over £130 on Amazon, the Sony UBP-X500 is quite impressive but has a few bad points. The biggest let down is the lack of onboard wifi. So you’ll have to update the software either via USB or Ethernet. This could cause a number of headaches and may even involve you needing to move the unit to your wifi router. The UBP-X500 lacks connectivity options as it only has a single HDMI output. While this might not annoy you, it will if you plan to create a home theatre setup in the future. Also, you’ll need to remember to buy an HDMI cable as none are included. Final negative, the lack of control on the unit. You’ll want to place the remote somewhere safe as you can’t control the basics from the unit. On to the positives. First, the unit can play a range of formats via the USB socket and, of course, DVDs and Blu-rays. However, unlike the LG BP250, the Sony UBP-X500 doesn’t support image files. The picture quality is worth the price alone and the built-in technology is future proof. As the software adjusts based on file formats, the quality is the same regardless of the media type. The sound quality is equally impressive. We can easily imagine when paired with a sound bar and subwoofer, it would provide an experience close to the cinema. On balance, the Sony UBP-X500 scores 7/10. The Panasonic DMP-BDT180EB costs £79 on Amazon. It offers all that you’d expect from an entry-level Blu-ray player as well as some unique features. Starting on top, the DMP-BDT180EB has the basic controls built-in. You can easily turn the unit off/on, open/close the disc tray and start/stop playing the media. This is a bonus over the Sony above and will be helpful for those time the remote goes walkies! On the front, you have the disc tray, USB input and power led. The rear is just as simple with a power input, LAN Ethernet socket and HDMI output. Overall the unit’s design and control make setup and basic operation really simple. In terms of file formats, the Panasonic DMP-BDT180EB can play Blu-rays, DVDs, and CDs. Using the USB port on the front, the unit can reproduce images (jpeg), audio (mp3/Wav) and more. It will be of no surprise that the unit offers 4k upscaling, ensuring the same high picture quality regardless of the media. The unit also has built-in 2D to 3D software, which really brings the film to life! The audio side is equally impressive and uses Dolby Digital/TrueHD and Dolby Digital Plus. The best feature on the Panasonic DMP-BDT180EB is wifi. Using the unit’s wifi, you can stream from your phone or any DLNA enabled device. You can also download and use a wide variety of online content and internet apps. Finally, the remote, it contains far more options that you’ll ever need. However, it’s easy to use and fairly simple to understand. Plus, it even has a Netflix button! Setting you back an affordable £79 (available from Amazon), the Panasonic DMP-BDT180EB is an excellent unit. It may not deliver the picture or sound quality of the Sony, but offers much more than the LG and Sony units above. Like the other two units, the Panasonic has limited connectivity. However, the onboard wifi closes some of this gap. The Ethernet port is also useful if you want to hardwire it into your router and avoid wifi dropouts. As you’d expect the DMP-BDT180EB plays a number of file formats. The picture quality is good as is the sound. We like the control on top of the unit. While it might be a pain to access these if the unit’s under a shelf, they provide all the basic controls you’ll need. The remote while overly complex (read features more buttons than you’ll ever need), actually it’s quite useful. The Netflix button is a superb addition. Considered by many to be a great no-frills Blu-ray player, the LG Electronics UBK80 4K Ultra HD HDR Blu-ray Player at £109 (available from Amazon) offers fantastic value for money. The UBK80 plays a range of media, all in 4K quality. The disc tray allows you to play DVDs, Blu-rays and CDs. The USB socket on the front enables you to play movies and other media via a hard disc or phone. While these are fairly standard, it’s the internet capabilities which make the UBK80 exciting. Once connected via Ethernet, you have immediate access to Netflix, Youtube and other streaming services. The software which powers this LG is unique. The 4k upscaling software enhances the picture quality of your old DVDs. And as a result, you’ll won’t notice much change in quality between Hi-Def Blu-rays and DVDs. In addition to the disc tray and USB socket, the front features buttons for tray open/close, play/pause, stop and power on/off. The rear contains a nice surprise! There’s an Ethernet port, HDMI 2.0 output and optical audio out. As well as a fixed power cable. So if you’re running a 5.1 surround system or a soundbar, you can easily hook it in. While you have access to basic controls on the LG Electronics UBK80, the remote a wider set of options. The remote syncs with a range of TVs and allows you control over power, input and volume. At a £109, the LG Electronics UBK80 Blu-ray Player is a slim, sleek and affordable unit. While slim, some users have noted that the unit sometimes produces low droning noise. The UBK80 doesn’t have built-in wifi or Dolby Vision support. However, you can access a range of streaming service via Ethernet. We dislike the attached power cable as it means you’ll probably end up moving plugs around and still find the cable is slightly shorter than needed. The optical audio output is a nice feature and allows you to easily connect a soundbar. This isn’t a feature you’d expect for the price. Since most remotes are more complex than needs be, the UBK80 doesn’t disappoint. However, with basic control on the unit’s front, you might not need a remote. Some users have reported that the remote is highly directional, so you’ll have to be accurate with your aim. A redeeming remote feature is the TV controls, which once and for all will save you from embarrassment! As one of the most expensive in our list, the Sony UBP-X700 4K Ultra HD Blu-Ray Disc Player will set you back £184.00 (from Amazon). With a long list of formats the UBP-X700 can play, listing them all would be pointless. Suffice to say, the list includes DVDs, Blu-rays and CDs. The unit deliveres the ultimate 4K HDR viewing experience with HDR10 and Dolby Vision support. Plus the onboard wi-fi enables access to a range of Streaming Services. Looking at the unit itself, the sleek front features a disc tray, USB socket and buttons for power on/off and tray open/close. For the price, the rear options don’t disappoint. In addition to a power socket, there’s an Ethernet port and coaxial output. The unit has 2 HMDI outputs, the first output visual and audio, and the second transmits audio only. This is the best set option of any units so far in our list. Finally, the remote. Like all Sony remote, this is has a vintage 80’s vibe! Putting looks to one side, the remote is fairly basic and so easy to use. In addition to control over all that you’d expect, the remote also has a Netflix button. Starting with the obvious, the Sony UBP-X700 at £184.00, is fairly expensive. However, in our opinion at least, the price is worth it. The picture quality is amazing across multiple media types. Old DVDs look like 4K Blu-rays, it’s actually hard to tell the difference. The built-in Wi-fi is great for playing Netflix, which can be accessed through the remote. The audio output is equally impressive, especially when you link a sound bar or surround sound system using the second, audio-only HDMI output. Even using multiple outputs, set up only take a few seconds and the UBP-X700 works straight out of the box. The Samsung UBD-M7500 features a unique design, superb spec list and costs £165 (available on Amazon). Whether you’re playing a DVD, Blu-ray or media via the USB input, the UBD-M7500 faithfully reproduces the pictures in UHD. At 4x higher resolution than Full HD, UHD creates a more detailed viewing experience. Luckily, Samsung has included automatic HDR TV settings, which means you can plug and play, and enjoy the experience within seconds. In addition to the dics tray and USB input, the front includes power on/off, tray open/close, play/pause and stop controls. This means you can easily play a disc without needing to search for a remote. In terms of the remote, thankfully is simple and easy to use. You can easily control the unit and also your TV. This style of remote may not appeal to everyone, however, we like its simplicity. As you might expect, there’s a range of connectivity options on the rear. There’s a power input, Ethernet input and HDMI output. There’s an optical audio output, perfect if you’re using a soundbar. While the Samsung UBD-M7500 doesn’t have built-in Wi-fi, using the Ethernet port you can quickly access a range of apps and content via the customisable Smart Hub. With the Samsung UBD-M7500, there are almost no negatives. The only point we could fault is the unit’s lack of Wi-fi. Overall, the unit is sleek and has plenty of options. The UHD resolution means you won’t need to replace the unit for years. And the onboard upscaling software means you can enjoy all of your old DVDs, just in the same detailed high definition. While some will hate how simplistic the remote is, for the majority of users, they’ll like it. Plus if it goes missing, the controls on the unit’s top provide enough options to continue playing media. Sporting a compact design and impressive spec list, the Panasonic DP-UB320EBK 4K Ultra HD Blu-Ray Player is very affordable at £99.00 (from Amazon). When size does matter, every centimetre counts. And while we normally wouldn’t care about size, Panasonic has done something impressively with the DP-UB320EBK. It’s 32 cm long. This makes it perfect for bedrooms, the kitchen, second home and even as your main Blu-ray player. As you might expect based on the size, the connectivity options are limited. The rear features a power input, Ethernet port and HDMI output. These options might disappoint some. Moving our attention to the front of the unit, it’s sleek with a disc tray and USB input. There’s also a power switch and LED, as well as a tray open/close button. In terms of file formats, the DP-UB320EBK can play Blu-rays, DVDs, CDs as well as various media types using the USB input. So whether you want to view old photos, listen to a current hit song or watch a film, you can, in stunning quality. At the heart of the DP-UB320EBK is HCX picture processor and 4K Direct Chroma Upscaling, which produces Ultra HD premium quality regardless of the medium. With no built-in Wi-fi, the unit connects to your home network with Ethernet cable. This enables the unit to update its firmware and allows you to play media from other devices and Netflix. Finally, the remote, sadly, it’s overly complex. It does have all that you expect as well as some nice extras. There are a Netflix button and TV controls. It’s fairly straightforward to sync with any VIERA Link enabled Panasonic TV. At £99, it would be easy to be fooled by the price. However, Panasonic DP-UB320EBK is a superb unit. For the price, some of the negatives are somewhat excusable. Yes, there’s no Wi-fi and the rear connectivity is basics. However, both of these options are available in the more expensive DP-UB420EB model. Our well stated by now, save for the Netflix button, we dislike the remote as it’s overly complex. Surely, it’s easier to have a slimmer remote with all the fancy options on a menu? Anyway, this is subjective. After spending seconds setting it up, the picture and audio quality is incredibly detailed and you’ll notice a difference. The upscaling software is good and means there’s little difference in quality between media types. The Samsung BD-J5500 3D Blu-ray and DVD Player with Built-In Apps (available from Amazon at £149.99) offers a range of new features and follows on from the Samsung BD-J4500R, itself an excellent Blu-ray player. Loaded with a number of apps, the Samsung BD-J5500 is far more than just a Blu-ray player, although it does that with ease! The unit plays a range of media including DVDs, standard Blu-rays and 3D Blu-rays. In addition, the USB socket extends this list, as does the Ethernet port. Connecting the BD-J5500 to wi-fi via the Ethernet port allows you to watch streaming services such as BBC iPlayer and Netflix, as well as from your PC or tablet. 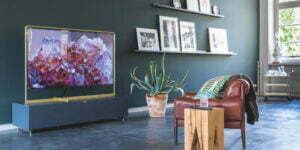 Samsung has developed its own upscaling software, which ensures the quality is the same regardless of the media type. Whereas the unit uses Dolby True HD and DTS for superior sound quality. Let’s take a look at the rear. The unit comes with an attached power cable, which is less than ideal. There’s an Ethernet port, HDMI out and coaxial digital audio output. Moving on to the front, there are buttons for power and to open/close the disc tray. There’s also a disc tray and USB input. Finally, the remote, which is essential, seen as there’s a lack of control on the unit. No surprises here, it’s overly complex but does offer buttons for control over a Samsung TV. For a penny shy of £150 the Samsung BD-J5500 offers much for the price. While it doesn’t have wi-fi, once connected via Ethernet, it does offer access to a range of streaming services through Samsung smarthub. The picture and sound quality are superb. As the unit support 3D Blu-rays, it’s future proof. Yet the BD-J5500 is smart enough to play DVDs at high definition. The coaxial digital audio output is a welcome feature and enables you to hook the unit up to a range of sound systems. Of course, if you only use the HDMI output then setup takes seconds. We don’t like the remote and the already attached power cable. However, both are minor issues. Overall the Samsung BD-J5500 3D Blu-ray and DVD Player scores 7/10! Starting with our standard advice. Make sure you purchase the necessary cables at the time of buying your Blu-ray player. Most units, at best come with only a power cable. So avoid disappointment and buy high-quality gold plated cables. You’re worth it! We’re impressed with the current range of Blu-rays players under £200. All 8 in our list are good choices. If you’re just starting out or buying one for a bedroom or kitchen, then consider the LG Electronics UBK80 or the Panasonic DP-UB320EBK. Both are affordable, feature packed and are future proof. If you’re looking to upgrade and don’t need built-in Wi-fi then you’ll want to purchase the Samsung BD-J5500. Taking our top spot is the Samsung UBD-M7500 Ultra HD Blu-ray Player, which at £165 is worth every penny and has features list to match. While the Sony UBP-X700 4K Ultra HD Blu-ray Disc Player is more expensive, it deserve to be second on our list for it’s features, the brand and options. It would be at the top if it had built-in Wi-fi. When all is said and done, you can’t go wrong with any of these 5 Blu-ray Players. Have we missed any units or brands? How Safe is Your Neighbourhood? My Dream Haus participates in various affiliate marketing programs, which means we may get paid commissions on editorially chosen products purchased through our links to retailer sites. © 2017 - 2019 AJS Digital Group.